Fourth of July is coming up this weekend! And even during these times when I feel like the country is going in the wrong direction, it is still one of my favorite holidays. Two hundred and thirty-nine years ago, some brilliant men constructed a form of government founded on biblical principles and the idea that all men had a right to be free from tyranny. That is still worth celebrating. Last weekend, I attempted to make some patriotic fudge. I made it once a couple years ago, and it was pretty and yummy, so I wanted to attempt it again so I could share the recipe. I have to admit, the fudge was almost an epic fail! I am honestly not quite sure what was going wrong, but I had to jump through some hoops to make sure it was going to set up. But when it finally did, it was delicious. I might have just added a bit more food coloring to make it more vibrant. To make the fudge I tweaked this recipe by changing up the quantities and add-ins. 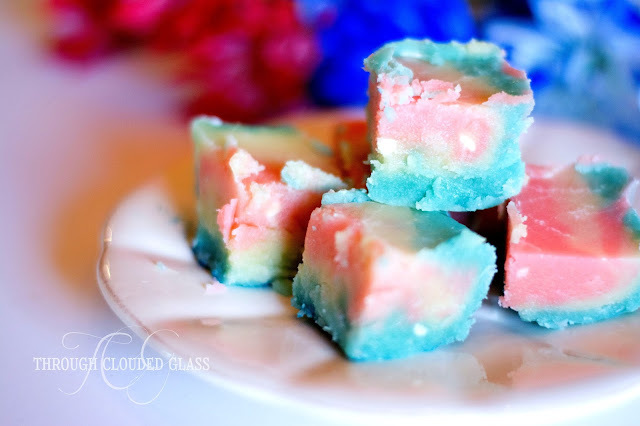 The following recipe for Patriotic Fudge is the result. 1. Prepare am 8x8 baking pan by lining with tin foil and greasing with non-stick spray. Add 4-5 drop of blue food coloring to the lined pan. 2. Mix together the sugar, milk, and butter into a heavy saucepan. Bring to a rolling boil, and boil for five minutes. 3. Remove fudge from heat and add the flavoring. Slowly mix in the white chocolate chips. Fudge is unpredictable, so if the fudge seems to be thick enough to set up with just this stage, stop here and proceed to step 5. 4. Return fudge to burner, and boil until mixture reaches a soft ball stage (ie. a little of the fudge mixture dropped into cold water will be firm enough to form a soft ball with your fingers). Remove from heat and whip with a wooden spoon. The fudge mixture may still seem fairly thin at this point. Don't panic! 5. Add 1/3 fudge mixture to the prepared baking pan, and carefully mix the fudge with the blue food coloring (careful not to tear the tin foil). 6. Add 1/3 of the remaining (white) fudge mixture to the tin foiled pan. You can swirl it around a little bit over the top of the blue fudge. 7. Add red food coloring to the fudge remaining in the saucepan and mix. Add the red fudge on top of the tin foiled pan, swirling the red fudge over the top of the other layers. My fudge mixture was thin enough that I could tell the fudge would have a marbled effect when it set, so I didn't mess with it. If your fudge is thicker and doesn't seem to be blending very well, you can always carefully cut through the mixture with a butter knife to give prettier swirls (don't over mix). 8. If your fudge turns out thicker, you can be done and serve! But if it's like mine and seems really thin, it's to be expected. Say it with me: fudge is unpredictable. Put it in the fridge for an hour, and it will firm up! 9. When the fudge is set, take the fudge out of the fridge and remove the tin foil. Cut into squares and serve! There you go! If you are new to making fudge, I would just say not to let it intimidate you. I have been making tons of different fudge recipes for years, and you never get it prefect every time (as evidenced by the fact that I almost ruined this batch). 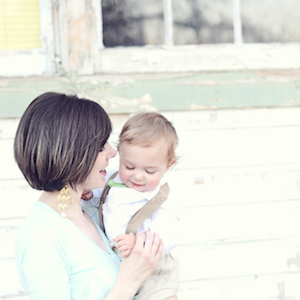 You eventually learn to save it, but it takes practice! Luckily even the mess-ups are pretty yummy. 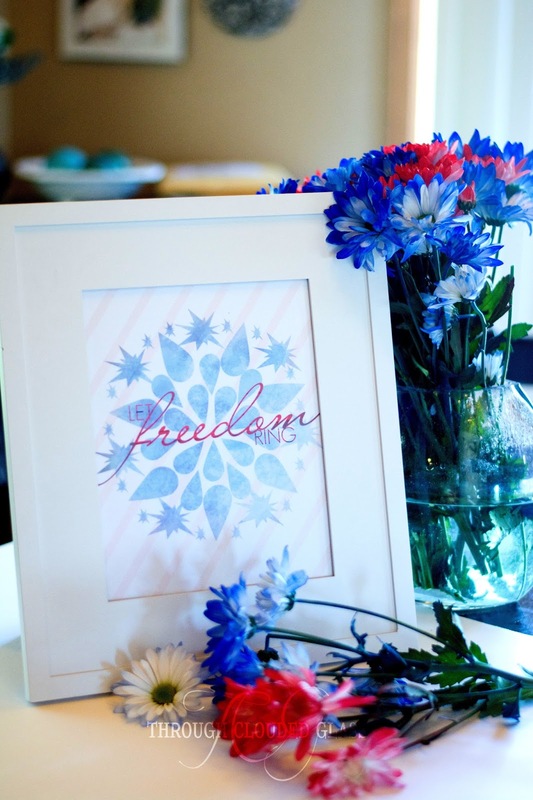 In the spirit of patriotism, I also have a 4th of July printable for you! Click here to download it. Is It All A Waste? Need A Book For Vacation? And It's A . . .